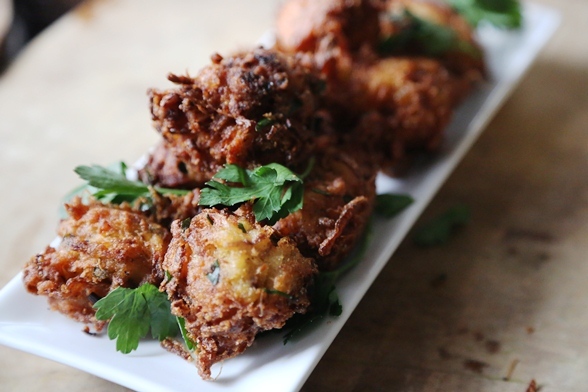 This recipe makes approximately 30 ping-pong ball sized onion bhaji. Soak tamarind pulp with hot water until soft and pulp is soft and squishy. Squeeze as much pulp out and discard the seeds/sacs. Mix everything together and keep in the fridge until ready to use. 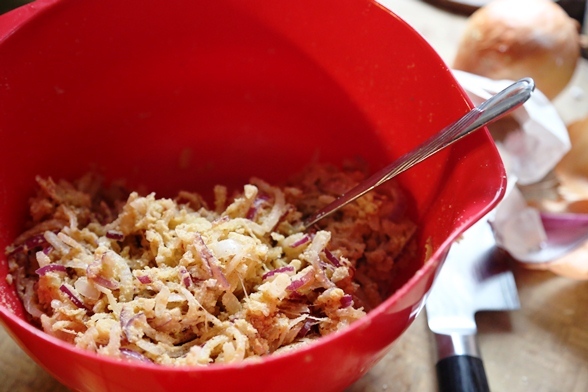 Put your sliced onions in a large mixing bowl. Set aside. In another mixing bowl, mix all the other ingredient in with a spoon. You will get a sandy looking mixture and that’s fine. Pour the flour mixture into the bowl of onions and with your hands, really work the flour into the onions. Don’t be afraid of squishing it because you want the onions to sweat, the juices will transform this dry-looking mixture into a workable paste. Just remember that if you feel it’s too dry, leave the mixture for 10 minutes to let the onions sweat and then mix again. If it’s still too dry, you may add 1 tablespoon of water. 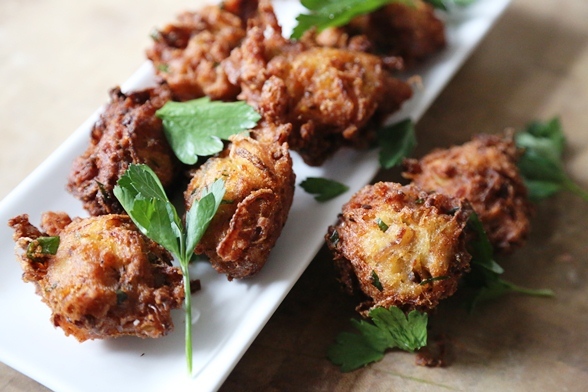 This genius method is what gives this onion bhaji recipe it’s incredible flavour as there is no dilution, only onions and it’s natural juice. Once you get the onion bhaji mixture into a nice workable paste, they should hold their shape if you scoop them up with a spoon. Heat a deep pan with vegetable oil. You want to have about 1-inch of oil in your pan for frying. Fry up scoops of onion bhaji (you can decide on how big you want your bhaji to be) until they are golden and crisp and drain the excess oil to keep the bhaji crispy for longer periods of time. Eat with the tamarind dipping sauce.